You’ve made the decision to get into better shape. You’re working hard, and much of that work takes place at home, especially if you don’t have the time or money for a gym membership. Pull ups are a great exercise that work the muscles in your back, arms, and core for a blistering workout that will get your heart pumping. There’s just one problem: unless you happen to have a jungle gym in your back yard, you’re going to need a pull up bar to help complete those important exercises. Here, we’ve taken the headache out of choosing the best one for you. The Ultimate Body Press Wall Mounted Pull Up Bar is a gym-quality bar that will withstand years of hard use within your home without requiring you to pay gym membership prices. It’s constructed from gunmetal grey steel, so it’s strong enough to handle all the weight you can put on it. You’ll love exercising with a pull up bar that has been designed with all of your needs in mind. Padded foam grips on the parallel handles of the Ultimate Body Press pull up bar are designed to increase your comfort throughout your exercise routine. Whether you’re lucky to manage one or two pull ups or you’re used to cranking out twenty at a time, this padded grip offers a solid gripping surface that will hold your hands firmly in place while offering the comfort you need to keep cranking out reps. When the time comes to install your pull up bar, you don’t want to find yourself staring at it, wondering how on earth you’re going to keep it anchored to the wall. Luckily, the Ultimate Body Press bar is designed with your home in mind. With screw holes that are 16” apart, the same distance as the studs in most standard residential constructions, it will attach securely to the studs in your wall. Stud mounting is necessary in order to ensure that the pull up bar remains in place no matter how much weight you’re swinging from it. Sheetrock and paneling aren’t designed to take that weight. The studs, like the bar, can handle it. This bar is also designed to be as stable as possible: no more wobbly bar that makes you lose your grip and drop down to the ground before you’re finished with your workout. Pull ups are a great fat-burning exercise that ramp up your metabolism and kick your body into high gear. Over time, however, you may discover that you want to shake things up a little—and the Ultimate Body Press bar accounts for that. With four different hand grip positions, you can change up your training routine and sculpt your body in more ways than ever before. The difference in grip positions allows you to continue offering yourself a challenge even as your skill and strength increase, improving the effectiveness of your entire workout. The Ultimate Body Press team is dedicated to ensuring customer satisfaction, so they’ve taken customer feedback into consideration as they’ve worked on the design of their pull up bars. The newest bars include a bar width of 40 inches, 13 inches between the bar and the wall to allow plenty of room for swinging feet and other issues, and a parallel grip length of 5.5 inches. All of these improvements have been made as a result of customer feedback, making it obvious that Ultimate Body Press gear will meet your specifications for a satisfying workout. This is a solid, highly functional pull up bar that is designed for serious at-home athletes and the occasional pull up enthusiast alike. Taller individuals will love the ability to hang this bar exactly where they need it in order to keep their feet from dragging on the ground, while heavier athletes will appreciate the rugged, tough construction that will hold up to even hard use. While more expensive than some of the other bars available on the market, the Ultimate Body Press bar makes up for it by being an investment that you’ll only have to make once. When you need that amazing upper body workout in a small space, the JFit Deluxe Doorway Pull-up Bar is the perfect choice. This bar is designed to minimize its appearance. The sleek bar will expand from 26 to 40 inches, which means that it will fit in nearly any standard size doorway. It even stretches out long enough to fit in larger doorways, making it perfect for larger, more open rooms that don’t have traditionally sized doors. Its customizable fit ensures that it will fit in your doorway, rather than requiring you to find a doorway that will work for it. Even better, it is durable and supportive, allowing for up to 250 lbs to perform pull ups and chin ups in any doorway throughout the house. The JFit Deluxe Doorway Pull-up Bar is designed to work as part of a complete home fitness system, fitting neatly into your doorway and offering plenty of accessories that will help bring your workout to the next level. It includes a sit-up attachment that will help hold your feet when you’re working on sit-ups, making your ab routine better than ever. This bar is also the perfect piece of equipment to use for band-assisted pull ups or when you need a bar to hold your resistance bands throughout your workout. If you aren’t quite ready to dive in with pull ups just yet, it’s a great intermediate step that will help you build strength while you work your way up to full pull ups. The JFit bar considers your safety and comfort to be top priority. Included with the bar are easy-to-install safety caps that require just a few small screws to attach to the doorway. They help hold the bar in place and prevent it from wobbling when you’re using it, making for a much more secure workout. It also has adjustable grips so that you can decide for yourself where you want to hold on. Shooting for that wide pull up? Slide the grips out and position them where you need them most. Prefer a narrow chin up? The grips will adjust to that, too. One of the best features of the JFit pull up bar is your ability to take it down and put it away when you’re done with your workout. While the safety caps will remain in the doorway, the pull up bar doesn’t have to. If you have children at home who can’t keep their hands off of it or simply want to remove the bar so that everyone can walk through the door without hitting their head, this bar can be easily twisted down and tucked away until your next workout. When you’re ready to exercise again, simply pull it back out and use it again. It couldn’t be easier! For portability, convenience, and ease of use, the JFit pull up bar can’t be beat. You’ll love how easy it is to get in a great workout without needing to leave home. At the same time, you’ll appreciate being able to tuck the bar away when it’s not in use, especially if you’re living in a smaller apartment or rental home where every inch of space counts. Like the wall mounted bar that made the top of the list as our gold pick, this ceiling mounted pull up bar is made by the Ultimate Body Press company—a company that is dedicated to quality and strength. It’s designed to be mounted on the ceiling on joists that are either 16” or 24” apart, making it perfect for standard residential construction. It’s built tough, designed to withstand plenty of weight and plenty of hard workouts. You’ll love the easy, convenient installation as well as the fact that once it’s installed, this pull up bar isn’t going anywhere. Some reviewers have noted that with unusual ceiling types, it’s necessary to use longer bolts in order to get a sturdy installation. Once that hurdle has been overcome, however, the Ultimate Body Press bar is ready for action. 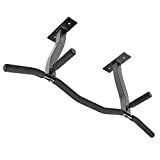 With three dedicated grip positions, the Ultimate Body Press Ceiling Mounted Pull Up Bar is ideal for fitness enthusiasts who want to be sure they’re taking full advantage of the great workout offered by chest and back exercises in a variety of positions. With wide angle grips, chin up grips, and pull up grips all in one convenient bar, it’s like having a gym right there in the convenience of your home. Each grip is designed to create a natural hand position that will allow you to get a better workout without putting unnecessary stress on your joints. The grips are all covered with padded foam to create a more comfortable gripping surface for all your pull ups and chin ups. This ceiling mounted pull up bar is designed to provide plenty of clearance so that you won’t hit your head on the ceiling at the top of your movement. With 14” of space between the bar and the ceiling, you’re able to do pull ups with the assurance that you aren’t going to have a bruised head in the morning. Particularly tall individuals with low ceilings may find that this makes it more difficult for them to complete a full pull up without their feet brushing the floor, but tucking the feet and raising the knees can help compensate for this problem. The Ultimate Body Press bar is also a great tool for individuals who are using resistance bands to work their way up to full pull ups. Building strength takes time, and resistance bands make the entire process smoother and easier. Many users will find that thanks to the strength of this bar, it’s perfect for threading a resistance band through and will hold up to those types of exercises just as well as more traditional pull ups and chin ups. When you’re looking for a tough, sturdy pull up bar, you can’t do better than the Ultimate Body Press Ceiling Mounted Pull Up Bar. Once it’s installed, you won’t have to worry about it moving when you don’t want it to. You’ll get the smooth exercise you’re after every time, making this a great addition to your home gym. Sometimes, your budget is a bigger factor than exactly what features your pull up bar will come with. 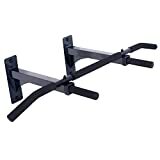 Thankfully, the Stamina Doorway Trainer Plus bar offers an excellent pull up bar for anyone on a tight budget. This bar is designed to be easy to install, move, and install again. 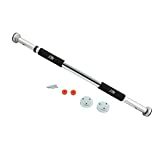 Whether you’re looking for a convenient sit up bar that will help hold your feet in place or a pull up bar that can take up to 250 pounds of weight in the convenience of your own doorway, the Stamina pull up bar is a great inexpensive option. The Stamina bar, like many of the more expensive options, comes with multiple options for hand grips. With five grip positions, you can perform pull ups, triceps dips, and chin ups with ease. Each grip position is covered in foam, offering an additional layer of comfort and grip support that will make the pull up bar easier to use. It’s also designed to make a convenient push up bar. Just pull it off the wall, place it on the ground, and use the grip positions to direct your push ups. It’s perfect for decreasing wrist discomfort and making it easier for you to keep churning out reps when you need to get in a great workout fast. Unlike many of the other bars on the market, the Stamina bar isn’t adjustable. It’s designed to fit in a standard doorway, making it a poor choice for homes with larger doorways that might not hold the bar up properly. As long as you have a 34”-36” doorway for your bar, however, you’re ready to get down to business! The Stamina Pull Up bar is a great budget option that delivers on performance. It’s a mini gym all by itself, with great versatility that makes it the perfect choice for getting started on a new workout routine on a minimal amount of equipment. You don’t need a large number of fancy options to get started. This pull up bar, with its sit up and push up options, is all you need to start toning your body and getting into better shape. When choosing a pull up bar, one of the first things you need to decide is how you’re going to mount it. Do you want a bar that hangs in a doorway, one that hangs from the ceiling, or one that is mounted to a wall? There are several factors that you’ll want to take into consideration before deciding how you want your pull up bar to be mounted. First, look at the ceiling in the room where you want to hang your pull up bar. If you have very high, vaulted ceilings, a ceiling-mounted pull up bar probably won’t work well for you. On the other hand, if you have very low ceilings, a door-mounted pull up bar might not be convenient, either. Take a look at your home and consider where you plan to install the bar before deciding on the type that will work best for your needs. Next, consider how portable you want your bar to be. Some door-mounted models are quick and easy to move from one room to another. Bars that are mounted on the ceiling or the wall, on the other hand, are going to be stuck in one place. This will have significant bearing on the type of bar that will work most efficiently for your needs. When you choose a mounted pull up bar, you need to take your home situation into consideration. If you own your home and you’re hanging the pull up bar in your basement or home gym, you might not care what type of damage it does to the walls. After all, it’s there to stay until you move out! On the other hand, if you’re renting or plan to sell your home in the foreseeable future—presumably without your pull up bar still attached to the walls—you need to take the kind of damage that may be done to walls, door frames, and ceilings into consideration. A couple of little screw holes on the wall or ceiling are easy to repair. The scrapes and dings from months or years of use, however, may take longer to patch up. Take the time to research what other people have experienced when using a pull up bar before making your choice. For example, some users find that over time, the door mounted bar rubs paint off of the door frame and gradually creates divots in the wood. How often do you plan to move your pull up bar once it’s in place? Do you intend to leave it sitting in one location, probably inside your home gym, for years, or will you be picking it up and moving it around the house? P90X and other popular home fitness routines make excellent use of a pull up bar for both traditional pull ups and chin ups and as a support for bands, but they typically require the convenience of a television and DVD player. If you don’t have those in your home gym, you’re going to be spending a lot of time running up and down the stairs to get to your pull up bar! You should also consider how long you’re planning to stay in your home. If this is a short-term home for you, you may decide that it’s more practical to choose a portable bar that can be quickly and easily mounted in a doorway. On the other hand, if you plan to be in your home long-term, a wall or ceiling mount will serve you just as well. What accessories will you be using with your pull up bar? Do you intend to use it exactly as it is, with nothing added, or do you prefer a bar that will enable you to use gymnastic rings, ab straps, and push up rings? Make this decision before making a purchase so that even if you don’t buy the accessories up front, you can be sure that there will be accessories available that are compatible with the model you’ve chosen. It helps to consider who is going to be using the pull up bar. A man who intends to use it only to build strength, and only for traditional pull ups, may discover that he is fine with the bar alone. A woman who is gradually building up her strength, on the other hand, may need the assistance of bands and other equipment as she works her way up to full pull ups. It would be nice if you didn’t have to think about your weight when choosing a pull up bar, but the reality is, your weight is a serious consideration. Even serious athletes may tip the scales at over 250 lbs, especially if they have a high percentage of muscle. Check the weight limit on your pull up bar before buying. The last thing you want is to discover that it’s bending over time or, worse, that it won’t hold your weight to begin with. As many fancy exercises are there are now on the market, there’s still nothing quite like a good, old-fashioned, traditional pull up. As you build the muscles in your back, arms, and core, you’ll fall in love with your increased strength and capability as well as the feeling of confidence that goes along with it. Choosing a pull up bar, however, is a decision that must be made with care. You want to know that you’re getting a high-quality bar that will withstand all the use and abuse you put it through. All of the bars on this list are designed to give you the confidence and freedom to ensure that you’ve made a wise choice that will enhance your workout routine and help you build muscle for years to come.